Are advent calendars one of your holiday traditions? Instead of purchasing a disposable calendar, try making your own! Think about all the waste produced by advent calendars each year. Whether you’re filling your calendar with sweet goodies or daily activities, making your own calendar and reusing it from year to year is a great way to cut down on household waste. There are so many great design ideas online (bonus: choose a design that uses supplies you already have, or ones you can find at a thrift store). Making your own calendar is great, but you will still be producing a lot of waste if your calendar is filled with individually packaged sweets. If you want to include daily sweets, try filling your own jars with candy from a bulk food store and incorporating those goodies into your calendar. This works especially well if you make a mason jar advent calendar. Instead of candy or toys, try putting experiences into your calendar. Kids could even help choose the activities that are included. 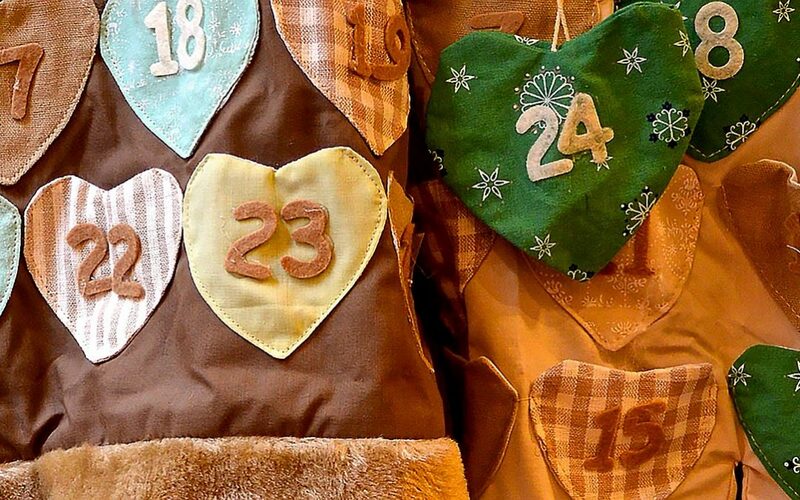 Not ready to make your own advent calendar? 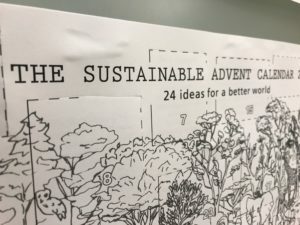 Consider an easier option: print a sustainable advent calendar online. Our office uses one from “The Sustainable Advent Calendar” website which can be downloaded for free (in multiple different langues) here. Whatever you and your family, friends, or coworkers choose this holiday season, remember to take waste reduction into consideration. Protecting our planet today is the best gift we can give future generations. Growing up, we had an advent calendar that was a series of tiny board books that told the story of Christmas – I’d hunt for the daily book and we’d read that day’s sentence or two, leading up to December 25th when the story of Jesus’ birth was finally told! Now with my husband, we still use his old Advent calendar from childhood, where we hang ceramic figurines on a stable-shaped board, representing Christmas-related figures like angels, camels, the Wise Men, and the Holy Family. Once we have kids, I want to do the Jesse Tree tradition 🙂 On a small Christmas tree, we’ll hang an ornament each day that represents a different part of the Christmas story or message.